Hello, my name is Tracey Rogers and I am the Executive Producer and Project Director of Wootton Bassett Rocks! Charity Single and Video. In 2009 my brother was repatriated through Wootton Bassett. In June 2011 and living only a few miles from the town as I do, I wanted to do something to say thank you to the town for the support and respect the people have shown to families like mine and decided to set up a project that would involve the people and community of Royal Wootton Bassett to provide continued support to bereaved families and injured soldiers, as repatriations through the town were coming to an end. I am not a musician nor am I in the film or music industry, but was inspired to do something both musical and creative involving as many people form the town as possible. My concept was for the townspeople to record a single and make a music video filmed in what has become the iconic Royal Wootton Bassett High St and Wootton Bassett Rocks! was born. The whole project has been exciting, nerve-wracking, challenging and extremely rewarding in equal measure and I am very proud of what the team has achieved, there so literally hundreds of people to thank! The hard work and spirit of this amazing community has produced a stunning cover version of Green Day's 'Wake me up when September Ends' which was recorded partly in Peter Gabriel's studios in Box, Wiltshire and partly in St Bartholomew's Church, the filming of the accompanying cinema quality video, was recorded in the now famous High Street on Sunday 18th September 2011 with over 1000 residents and friends of Royal Wootton Bassett. But this is just the beginning, the legacy that Royal Wootton Bassett has left behind has already left a mark on British society today and we hope that this project will also leave its own mark - perhaps by showing the town in a different way to the one we have seen on our TV screens for the last 4 years and also by raising money for 4 very important charities. The team are looking forward to 2012 to continue the project! 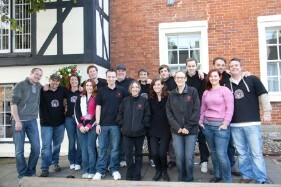 Meet the Wootton Bassett Rocks Team! In addition to the local team members below, we are proud to say that we have been assisted by internationally renowned companies in the production of our single and video. These include DOLBY (TM), Abbey Road Studios, Warner Records (US), Warner Chappell (UK), Real World Studios, Dreambase Studios, Firebird Films, Limepark Studios and Rendermedia. Wootton Bassett Rocks! was extremely fortunate to have the backing of these local professionals and their companies from the film industry; who managed the filming of the video to ensure that we had the best film crew, equipment and skills to back our project. These people were responsible for the vocals and recording of the Wootton Bassett Rocks! single 'Wake Me Up When September Ends'. Auditions were held in Andy Pett and Tiggy York's award winning Riffs Bar near Wootton Bassett. Tiggy was responsible for the vocal harmonies whilst Andy was band director. Richard Sutcliffe oversaw the recordings and production in Peter Gabriel's studio in Box, Wiltshire for the main vocalists; as well as the 250+ people of Wootton Bassett that recorded their part in St. Bartholomew's Church in September 2011. This team of Wootton Bassett locals organised the hundreds of people needed to make the video and made sure that everyone knew when to turn up, what they were wearing, what they were doing and where and when they were doing it! They are also responsible for running the Empire Cinema evening, merchandising, PR, web content and many other on-going jobs behind the scenes! None of them had ever done anything like this before and didn't really know what they were letting themselves in for! But as it turns out they have discovered many unknown skills and talents along the way!